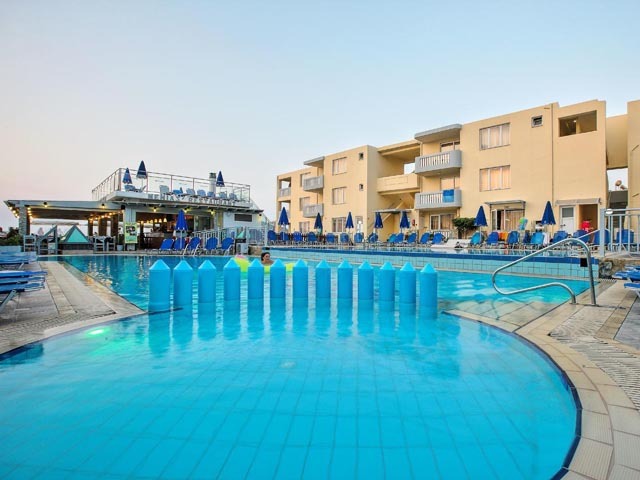 The seafront Porto Platanias Beach - Luxury Collection features 2 outdoor swimming pools, an a la carte Cretan restaurant and self-catering accommodation with free Wi-Fi access. It is located in the resort of Platanias, 10 km west of Chania. 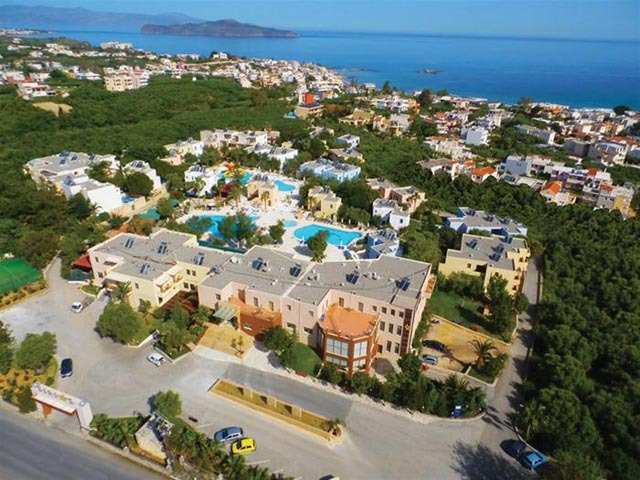 Porto Platanias Beach – Luxury Selection is located on the beach of Platanias, just 400 m away from the center of Platanias Village, one of the most cosmopolitan areas of the Chania region. The town of Chania and the Venetian harbor are located 10 Km away and the nation airport of Chania (CHQ) is 30 Km away. The hotel has been completely renovated in 2019 and redesigned as a Luxury Resort with elegant rooms and stylish surroundings. There are various room types: Standard double rooms, Maisonettes, Family rooms, Suites, Suites with sharing pool, and Suites with private pools. 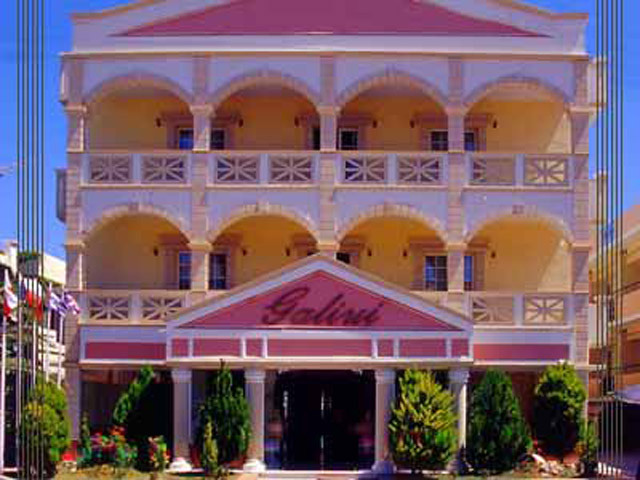 All the rooms are equipped with a marble bathroom with shower and a hair-dryer, central air conditioning units (heating & cooling), satellite TV, direct-dial telephones, WiFiinternet access, a mini bar, a safety deposit box, and they have a balcony or a terrace overlooking the sea, the pool or the garden. It is consisted of two single beds, a marble bathroom with shower and a hair dryer, individually controlled A/C, Satellite TV, music channels, direct dial telephone, WiFi Internet access, mini bar (available upon request), safe deposit box and balcony or veranda. It is consisted of two single beds, or one double bed, a large marble bathroom with shower and a hair dryer, individually controlled A/C, Satellite TV, music channels, direct dial telephone, WiFi Internet access, mini bar (available upon request), safe deposit box and balcony or veranda. It is consisted of two single beds and a double sofa bed, a marble bathroom with shower and a hair dryer, individually controlled A/C, Satellite TV, music channels, direct dial telephone, WiFi Internet access, mini bar (available upon request), safe deposit box and balcony or veranda. With a spacious master bedroom featuring 2 single beds or one double bed, and a separate living room with 1double sofa bed or 2 single sofa beds. They feature a large marble bathroom with shower and a hair dryer, individually controlled A/C, Satellite TV, music channels, direct dial telephone, WiFi Internet access, mini bar (available upon request), safe deposit box and balcony or veranda. One spacious room with 2 master bedrooms featuring 2 single beds or one double bed, and a separate living room with 1double sofa bed or 2 single sofa beds. the room has one large marble bathroom with shower and a hair dryer, individually controlled A/C, Satellite TV, music channels, direct dial telephone, WiFi Internet access, mini bar (available upon request), safe deposit box and balcony or veranda. A luxurious suite with 2 master bedrooms with double beds, and a separate large living room with 1double sofa bed or 2 single sofa beds. the room has one large marble bathroom with shower and a hair dryer, individually controlled A/C, Satellite TV, music channels, direct dial telephone, WiFi Internet access, mini bar (available upon request), safe deposit box and balcony or veranda. A luxurious suite with a sharing pool , featuring one master bedroom with a double bed, and a separate living room with 1double sofa bed or 2 single sofa beds. the room has one large marble bathroom with shower and a hair dryer, individually controlled A/C, Satellite TV, music channels, direct dial telephone, WiFi Internet access, mini bar (available upon request), safe deposit box and balcony or veranda. The hotel has one restaurant for breakfast, lunch a dinner. The breakfast and dinner are served in buffet and they composed from cold and hot appetizers, a large number of fresh salads, cheese, local and international specialties, and a very attractive fruit and a pastry buffet. For lunch the restaurant has an a la carte menu with a selection of light dishes and salads. The hotel has 1 Lobby Bar, and 1 Pool Bar. Guest can enjoy 1 large pool with fresh water and a separate paddling pool for children. The hotel has one Gym and a spa with 2 treatment rooms and a Turkish hammam. Internet Spot at the lobby (with an extra charge), free wireless internet access around the hotel, the lobby, the pools & the rooms. Our animation team offers you a variety of sports and fitness-oriented activities such as beach volleyball, boccia, water polo in the pool, aqua aerobics, pool games for children, yoga, aerobics, step etc. Also, during the evening there are various soft animation programmes with games and mini disco. Children’s pool, playground under parent’s supervision, Restaurant Baby chairs, Baby cots, mini club (open 4 hours a day) and babysitting available on request (one day in advance and with an extra charge). Scuba diving, Water Skiing, Windsurfing, Mountain bikes, Boating, Sailing, snorkeling & kite surfing. A private parking lot is available without charge in a 250 meters distance . The guests of the hotel can use the facilities of Porto Platanias Beach Resort & Spa and Porto Platanias Village Resort , without any extra charge.